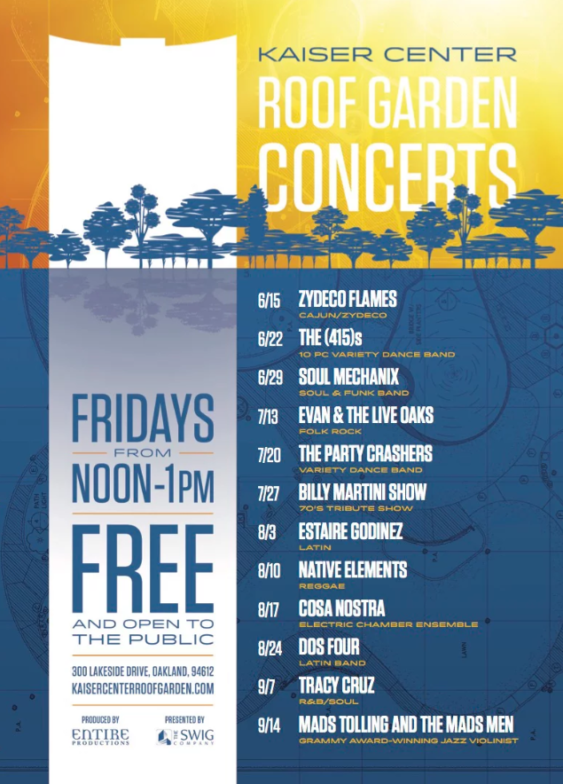 Pack your lunch and come listen to local jazz, rock, and hip hop musicians at the Kaiser Center’s roof garden free concert series from noon to 1 pm, every Friday from June 15 – September 14, 2018. The three acre roof garden at Oakland’s Kaiser Center was conceived as a semi-public park by Edgar Kaiser Sr. who decided the roof would be owned and maintained by Kaiser, but open to the public. Take any elevator located in the Kaiser garage to the ‘RG’ level to access the Roof Garden. Elevators to the Roof Garden are also accessible via the Kaiser Building, 2nd Floor Pedestrian Bridge.